Authors: Lim, M. H.; Murphy, T. E.; Ferrera, J.; Damask, J. N.; Smith, H. I.
Abstract: We describe a novel, versatile process for fabricating integrated Bragg-grating devices. Our process addresses many of the critical challenges presented by such devices, including period selection, alignment, spatial coherence, and nanolithography. 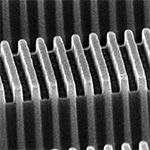 Using a combination of e-beam, x-ray, optical, and interference lithographies, we have successfully employed this process to construct 244 nm period, quarter-wave-shifted Bragg gratings on top of 1-um-tall waveguide structures in InP.